Collection of essays, blog entries. This is the table of contents for THIS IS A PICTURE OF YOUR GOD: A HUGH COOK READER, a fairly random collection of stories, poems, blog entries and the like. The section entitled DEATH POEMS contains poems originally intended for a collection of death poems to be called THE DEATH OF BIRDS. However, this project has been abandoned. Page 20  ISLAM. Part One of this Hugh Cook reader. While this is billed as a book for dipping into at random, the pieces are thematically grouped, and the theme of the first section is , broadly speaking, Islam. THIS IS A PICTURE OF YOUR GOD. Can we have a war between cultures, please? And could we have it right now? You go get the guns, I'll start hunting around for the ammunition. First published online February 2006. Note that any item listed as first published online first appeared when posted on the site zenvirus.com. Wasn't that why we had the Middle Ages, so we could get this stuff out of our system? This Islamic hospitality you may have heard about? Okay, this was my experience. George W. Bush exercises his free will and opts for an entirely unnecessary war. From time to time, from certain quarters, the chant of "Death to America!" is heard. The average American has, it seems, absolutely no thesis as to why this should be so. So what is this "jihad" business? An Islamic correspondent puts me in the picture. The context, of course, is that it was not the jihadists who started the war in Iraq but the Crusaders. British and American war crimes in Iraq: the use of radiation weapons against the civilian population. Technically, the civilians are not the target; in practice, they are the victims. A brief introduction to uranium weapons. The victors will, of course, write the history on this one. There will be no justice on this issue anywhere on planet Earth but, in a fair court  one imagines one run by space aliens  both the United Kingdom and the United States would stand condemned as war criminal nations. Part two of this Hugh Cook reader is a series of blog entries starting in January 2006 which, for the most part, relate to my brain cancer, first looking back at neurosurgery then confronting the possibility that the cancer may have returned. Daily life and non-cancerous things such as Edward Lear and my print-on-demand program also get touched on, in the unstructured manner of blogging. Children at a primary school (that is, an elementary school) in New Zealand are taught to mock the desecrated bodies of the dead. Nobody seems to question the appropriacy of this behavior, presumably because the culture which is being mocked is currently in no position to throw bombs. Brain cancer has arrived so it is goodbye to politics, goodbye to war, goodbye to the fate of the whale and the future of the world. The self closes down, the wider world vaporizing, replaces by the narrow arena of brain cancer and its complications. One's personal death, possibly right on the doorstep, outweighing the deaths of the many millions. Here, insights into what happened to me when I was under the knife: the details of my neurosurgery. There exists (this is my thesis) a door that I can step through to access an alternative reality. In this alternative reality, I am no longer the cancer patient. Instead, I am a married man with wife and daughter, living in a house in a tolerably prosperous city, going off to work in the morning and pursing my career. I have no idea whatsoever that this is the stuff of dreams and fiction. For me, the door is real, and so, too, is the promised world which lies just beyond it. My life, the life I had planned for myself, has been canceled. On a temporary basis, perhaps. Or perhaps forever. Back on my familiar drug, dexamethasone. The first lyrical honeymoon days of a good drug trip. Yes, this is not your quick ten-minute hike outside the boundaries of reality. This is a trip which is running for days. Yeah, and everyone knows that I'm doing these drugs, and they're watching. Watching for my mental lapses, too. My feeling is that, in large measure, my circumstances are out of my control. Even so, I feel bad about betraying my daughter. The system will deliver a diagnosis in its own good time. In the meantime, my life is in a holding pattern. Two scripts have been prepared for the movie of my life, one a kind of family comedy, the other a black-and-white movie about death and dying. I have no idea, at this stage, which script I am going to be handed. Whichever script I get, it gets played out for real in real time. Premature, because I don't yet know that I am dying. However, I have a window of opportunity, and questions I want to discuss, including, if it comes to that, the mechanism of my death. If the cancer has returned, it seems that there is just one drug on planet Earth which may (possibly, perhaps) be the answer. An introduction to the pharmaceutical industry and its marketing strategies: life is a beach. Why informed consent procedures are broken. What is broken, why it is broken, how it could be fixed, why it will not be fixed. As the brain cancer patient I have suffered brain damage from the cancer itself, from chemotherapy and from radiation therapy. The state of play, as far as I can make it. What it is like to be slid into the tunnel of the big magnet. This is as near as I can get to the experience: you lie flat for however long it takes (in my case about thirty minutes) and listen to the weirdest electronic music in the world. Meantime, life moves forward. An alphabet book by Edward Lear, A WAS ONCE AND APPLE PIE, is encountered and reviewed. Nominally the cancer patient, I am, in practice, in Total Writer mode, at least for the moment. Working, right now, on preparing a book for publication. As I do so, a story keeps coming back to me, a story by Ray Bradbury, the American science fiction writer who is the author of, amongst other works, FAHRENHEIT 451. This piece deals with the emotions of craftsmanship, of being the builder, the maker, of creating and sustaining a world. I, the author of this book, become the publisher of its second edition. A blurb of the book plus some final words. May be a little early for final words, but it does not hurt to have them on the record. And, in February 2006, I publish another boo, this one a fairly solid short story collection, THE SUCCUBUS AND OTHER STORIES, over 600 pages of SF, fantasy, horror, weirdness and strangeness. The TABLE OF CONTENTS is given, showing an item-by-item breakdown of the book. And here, to give a sample of the flavor of THE SUCCUBUS AND OTHER STORIES, is one of the items from the collection. But I get it not now but in a week. My crisis, if I can call it that, moves at the speed of global warming. Meantime, the productivity machine grinds on. 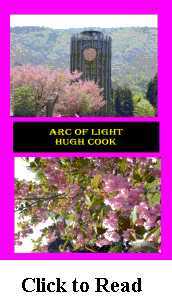 Having published the three books in the OCEANS OF LIGHT trilogy, I supply to the world a front cover of the first book in the trilogy, WEST OF HEAVEN, plus a blurb for the same book. The answer is whatever the answer is. One way or another, today I am going to get closure. Right? How things worked out for me on the medical front during the days in which this book was under construction. Part Three of this Hugh Cook reader. A selection of pieces constituting a concise guide to writing fiction, with special emphasis on the plot, and with a fairly elaborate look at the editing and proofreading as carried out on the final draft of the novel TO FIND AND WAKE THE DREAMER. What I know about writing and can usefully communicate on the subject is compressed into this fairly compact section. There is, please note, a traditional recipe for learning how to write, and it goes like this: write a million words and throw them away. Simple instructions for constructing a plot. A recipe, like a recipe for baking cookies. Some assembly required. Life experience is helpful: getting married, working on fishing trawlers, going to war, joining an organized crime gang, entering politics, living in a cardboard box for a couple of years, whatever. That said, this lean passage pretty much communicates what is teachable regarding plot construction. Read it and believe it. An expert writes. A simple solution to handling the boy meets girl business. Work habits, keeping track of work done, plot and promise. how many characters should there be? Managing transitions. Being satisfied with a simple straightforward workable sentence. A set of writing exercise. If you have total facility then you will learn nothing from this. If some things turn out to be easier than others then you may be able to extract a lesson from the experiment. If you cannot, then you cannot: the experiment is offered, but is not explained. Hint: to the extent that there is a message, the message can be extracted from the title, The Planet or the Shoe’. A long and deeply serious look at proofreading and editing, over seven thousand words going into details of how to hunt for typos, how to edit so things make sense and how to tweak the text for style. Warning: your sense of good style is, ultimately, your own, and my stylistic notions may not be yours. Page 259  Part Four  STORIES. Some fiction stories. Page 260  Item Thirty-Nine  GLORIA GETS MONEY. Gloria gets a very simple grant of powers. Page 262  Item Forty  HILDA SELLS HER BODY. Page 263  Item Forty-One  IMELDA BRINGS HAPPINESS. Page 265  Item Forty-Two  JANE RECYCLES EVERYTHING. Page 266  Item Forty-Three  KYLIE WINS COMPETITIONS. Page 267  Item Forty-Four  GALADRIEL SMITH AND THE MASSACRE OF THE ORCS. First published in LEGEND in 2000. 3,835 words. Fantasy. Page 280  Item Forty-Five  UPGRADE. Science fiction story , 9,173 words. Page 312  Part Five  POEMS. Assorted poems, otherwise uncollected. Page 313  Item Forty-Six  STILL LIFE. First published in CRACCUM in 1978. Page 316  Item Forty-Eight  TROY. The opening of a projected epic about the Trojan War. First published 1986. Page 345  Item Forty-Nine  CICADA SUN. A high school poem written under the influence of THE WASTELAND. First published in the New Zealand literary journal LANDFALL in 1976. Page 354  Item Fifty  BEING DEAD. Page 383  Part Seven  WRAPPING UP MY LIFE. A few tag ends wrapping up some of the broken pieces at the end of my life. Page 384  Item Seventy-Two  RETURN TO JAPAN. After having cancer and having advanced well down the path to total blindness, I return to Japan, having departed in December 2004 for what had been planned as a short holiday, and finally getting on a plane back to Japan in April 2006. Page 387  Item Seventy-Three  REMEMBERING AND FORGETTING. Returning to Japan after a long absence, I explore the archeology of my life. Page 389  Item Seventy-Four  MEDICAL TREATMENT JAPAN. Ny medical issues are addressed swiftly and professionally in Japan. Page 391  Item Seventy-Five  SURVIVING JAPAN. Easy enough to do. The author gives his thoughts on his radiation oncologists.